I think my first introduction to improv-quilting was seeing the Gee’s Bend quilts. They were so different from the traditional quilts I’d always been familiar with and they just spoke to me. There’s something so freeing about their imperfection and rule-breaking, and moving in their authenticity. Ever since then I’ve loved seeing more true improv-style quilts – in other words, quilts that break the traditional rules of quilting and grow without a formalized plan and pattern. I’ve experimented with improv quilting a few times and I’m always surprised at how relaxing and inspiring it is to just sew fabric together with abandon. I need to do more of it. So I was excited to get to read Sherri’s new Improv Handbook for Modern Quilters. This book is a guide to the entire process of Improv Quilting – starting by discussing what Improv quilting is, tools, exploring color, a variety of improv-piecing techniques and then 10 different styles or “scores” to inspire you to create your own. Here are a few variations on the Bias-strip “Petals” theme made by students in Sherri’s workshops. (Click on the images themselves to learn more about the individual makers.) This technique takes improv piecing and design to a new level, adding bias curves to your repertoire. This book has beautiful photography, great instructions and is FULL of inspiration to help you on your own quilt-improv journey. It’s inspired me to do more improv sewing this summer (also a great way to use up scraps!) Visit Sew Mama Sew to read Sherri’s Top Ten Tips for sewing ruler free, to get a taste of what Improv piecing is like. You can also visit these sites to hear more about the different techniques shared in the book and see more of the inspiring creations to come out of Sherri’s workshops. She’ll be teaching at QuiltCon again this year and I’d love to get to take one of her classes! to give away to one of you! If you’d like to enter, leave a comment on this post. Giveaway open until Saturday, May 29 midnight MST. Kim says May 27, 2015 at 4:58 am Amazing!! This is the kind of thing that drew me into quilting! Those petal quilts are beautiful. 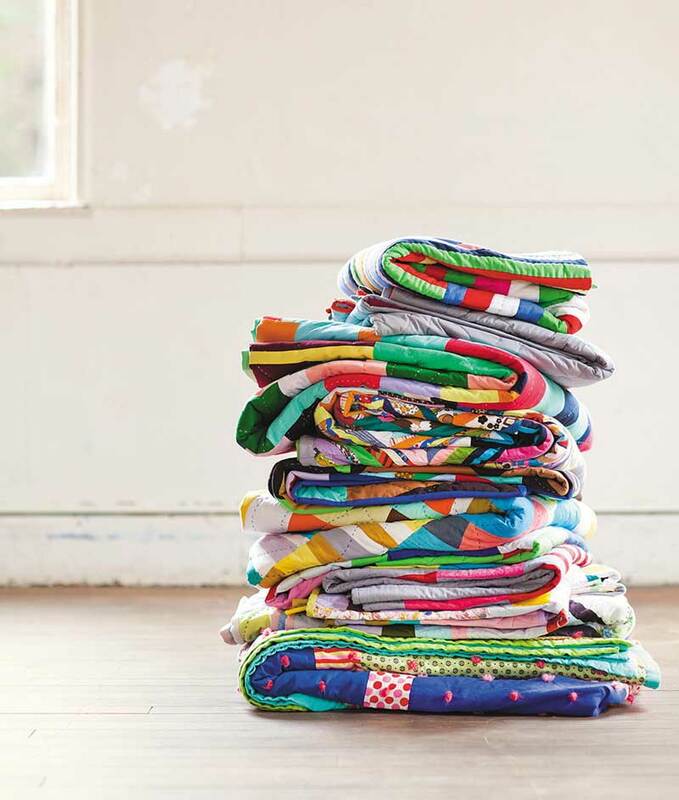 wow looks like a fun AND scary book for somebody who struggles with matchy-matchy…i love modern quilts and their colors…..would love to have this! Not my usual style, but I love learning new techniques. I like how quilts are developing into modern more and more, I would love to win this book and learn about new techniques. I love this..definitely out of the box! Improv’s a little scary. I fear wasting all that time and fabric and ending up with something I don’t like – but i sure love seeing other people’s improv work! Love all of these and love the freedom they exhibit! What fun! I really need to try improv- I’ve only ever made very structured quilts. Thanks for photos (and giveaway!)! I like scrap quilts, so I’m would like to learn this technique . I think it would be fun. Looks like a great book! Oh, what a challenge for someone who has trouble changing a pattern. I think it would be a good exercise for me. I’d love to try. Thanks for the review and chance to win the book. I have been following Sherri Lynn for a while and her techniques look so challenging and “out of the box” thinking for me. I would love to stretch and grow. Thanks for the giveaway. Big step for those of us who like patterns and order in our work. But it seems like it would be fun and freeing. Need that in our lives. I would love to learn to improv. piece a quilt. I adore the look of them, but am just not quite sure how to achieve it myself! So far I’ve been a chicken when it comes to improv. The petals are so beautiful; very inspiring! I just finished my first improv quilt and I LOVE the process!! I have been drooling over this book for some time. Thanks for the opportunity to win it! I’m taking the leap! Modem quilts here I come. I think I have enough traditional quilts finished to have the basics down. Ready for a new challenge. Would love to try this technique and get out of my comfort zone. That looks like a great resource! This post is dangerous! I’ve just spent way too much time poring over those pictures and those other links . What a great-looking book. Thanks for highlighting it. I’d love to try this. Thanks for the opportunity. Love your bias curve pieces. It seems like a fun new technique to try. Thanks for sharing and inspiring. Looks like color and design inspiration. I keep looking at those curves and marveling with the thought that those are improved! Oh, that looks like so much fun! Thanks! I will have to add an improv quilt to my ever growing quilt bucket list!! So beautiful! My improv experience is very limited but this book looks like it could motivate me to try more. Thanks for sharing the lovely photos and for the chance to win. Improvising looks like great fun, and would be a good way to move outside one’s comfort zone (in a positive way). This looks like a great book to get me out of my normal quilting ideas. I have enjoyed the improv quilts I’ve done. This book looks like a lot of fun & inspiration for more. NEAT! THANKS FOR SHARING A COPY IN THIS GIVEAWAY! I participated in the improv round robin workshop featured in the book. It was such a fun, liberating experience. I’d love to try some of Sherri Lynn’s other techniques. I have never tied improv quilting but it could break me out of what I normally do. These quilts are just fabulous! Would love to win this book and play with these methods a bit! This book looks so cool!! I love improv quilts sooo much. I love the petal quilts. Thank you for the giveaway! Improv quilting is certainly a challenge for me. I love the quilts of Gee’s Bend and hope to spend some time and learn with these ladies soon. This book looks likes so much fun! I would love to get my hands on it and play! This book looks so neat! I’d love to win a copy. I would LOVE to win this book. It’s only been in the last few years that I’ve followed patterns otherwise I’m a improv quilter at heart. I’d love to learn new techniques. Thanks for the opportunity! It sure looks like a Fun book to have. Thanks for sharing, I do appreciate all the inspiration and good ideas!! Improv quilting seems to be about letting go of control and just doing it. Something I’m not great at but it would be interesting to see what I can come up with! Looks like a great book. would love to get my hands on a copy. There’s nothing not to love about this book. I would really like to have a copy of it; I’m sure it would help me continue to stretch my limits. This looks like an amazing book! Thanks for the opportunity! I would like to have the courage to just start a quilt and not know how it would finish. The book looks like fun, thanks for the giveaway!! What a great book, such a variety of different styles. Thanks for the chance. I love the quilt that looks like kayaks. It is probably leaves but I see kayaks. I’d love to win a copy of “The Improv Handbook for Modern Quilters”. I love books & am in Australia so I wouldn’t even be able to go to one of Sherri’s classes at Quilt Com, but a book showing what is to be taught is the next best thing. Ta!!!!! This looks like a great inspiration! Thanks for the lovely giveaway chance! I have never done this kind of sewing. Looks like a good book to have. Wow what a great book. It sure would help me get out of my strict matching issues. Help me, please. looks like a wonderfully inspiring book! Thanks for the giveaway. Love the way improvisational quilts look but I’m a bit nervous to give them a try. This book sounds like it might help me overcome my fear of ruining some wonderful fabrics. the book looks beautiful! Looking forward to always learning something new. I would love to have a copy of this book! It looks like there are tons of new ideas for me to try! I’m just now becoming a fan of modern quilts. Would love this book! I’m really interested in learning more about improv and modern quilting. This book looks like a fabulous place to start! This book sounds positively liberating!!!! I’d be so excited if I won a copy. It would be so fun to try the projects. My machine and I are ready! I would love to wina copy of this book!! I love them all! How would you pick? Thanks for the chance to win your giveaway! Omg I need this book! I just found out about the Gees Bend quilts two weeks ago and have made two small quilt tops trying improv piecing. I love it! Thanks for the giveaway! The petal quilts are so lively. Love the shapes. Thanks for the chance to win. Improv is beautiful and scary!! Thank you for the great giveaway? Improv is beautiful and scary!! Thank you for the great giveaway. Beautiful book. Thank you for the opportunity. This book looks awesome! I have been wanting to try improv piecing and I think this book would give me the push I need! If love to win this book! Improv quilting intrigues me, but I need to learn the basics! I can’t even think about being improvisational. This is a mighty interesting book. Would love the improv book…I need to be more free! This book looks very interesting and I would love to win a copy. Thanks for the chance to win. The IMPROV technique would be a great out of the box experience for me! Thanks for the opportunity to win this book! i would love to make quilts like these!!! Thank you for the opportunity to win a copy of the book! I would like to add some improv projects to my list! This looks like a book to savor…and then set aside and be creative! I think would be a nice challenge for me. I do like the look of these quilts, so I do lean toward the modern side of quilting. Thanks for the chance to win. This book reinforces what I love about quilting–carrying the creativity through the entire process. It sounds like it would be challenging and rewarding and a really dynamic process. Thanks for sharing the pictures and for the chance to enter. Wow! I would love this book. Thanks for the awesome giveaway. Keeping my fingers crossed! I pattern tested for this and can’t wait to se the actual book. Thanks! I’m not sure if I am eligible to win this book, since I live abroad, but I wanted to share how invigorating it looks! Plus, it’s wonderful to see a whole new list of bloggers to check out. Thanks! thank you! i would love to win a copy!!! The quilts are wonderful and so refreshing!. This would be a great book to have – it’s so full of inspiration! Ruler free? That definitely would take me out of my comfort zone. Sounds like something I’d like to learn. I’d love to have a copy of The Improv Handbook for Modern Quilters! I haven’t tried this method and would like to learn to do improv-quilting! I was thinking i could use a little less structure. After all, it is Summer!! This book looks like a lot if fun to work from. Love the Petals. I struggle with improv and would love to let go and learn how to piece without a ruler! Loved looking at the pictures posted from the book. I’ve always done traditional quilts and am trying to do something different. This new book looks inspirational! I’m so interested in Improv Quilting and would love to read more about it and the quilters who use it! Amazing!! This is the kind of thing that drew me into quilting! What a great book! I love that she has come up with various ideas to use as a springboard to creativity! Just what I need to stretch my improv wings! This book looks interesting. Love the quilts. i love the color combos. i want to branch out into these. thanks for the chance to win. The petals are so beautiful, I can see them as a center of a bed quilt! I have been improv piecing for more than five years and it is pretty much the only way I create anymore. I’d love a chance to win! I’ve recently gotten back into quilting and this would be so inspiring! I have followed Sherri Lynn for a while and I love the work she does. She makes this look easy but just the process of starting seems to be daunting. I would love to read her book and make something inspired from it. Would love to have this wonderful inspiration! Thanks for the giveaway! Looks like a fantastic and colorful book! I really like the photo of the improve-quilt with the dark gray background and the petals (flames) rising up from the bottom of the quilt. I am going to try this idea on a smaller wall hanging. Thanks for the inspiration. I’m hoping my local library gets a copy. Of course if I win one they won’t need to! I am trying to break out of the “rules” rut and it looks like this is the perfect jumping board. The book looks amazing! It could really give me a kick-start into getting out of my comfort zone and creating improvisational quilts on my own. OH my, how inspiration and fun to see what everyone else is doing! I love the idea of this book. This book looks like a great resource. Thanks for the give away! I love modern quilting and designs. This book looks awesome. Since I usually don’t win giveaways, I just might have to buy it for myself. I love how everyone’s work turns out differently! My daughter sent me a copy of this amazing book for my birthday! (So I’m not entering the giveaway) I’ve been so intimidated by Improv–seems like a great mystery I couldn’t even begin to solve. But Sherri makes it so clear with each of her “scores” and then shares some of the infinite ways they can be interpreted. It’s perfect for a rookie like me, and I’m sure that experienced quilters will love it, too! I’m so glad you’re sharing it today. I just joined the Modern Quilt Guild and they talk a lot about improv. I need to get started and this book would help. Love the idea of improv quilting! Just have to get the nerve to try it! what a great new book to check out- love the beautiful improv petals-they look stunning.. thanks for the chance to win such a lovely book. I’ve never done any improve quilting, but am intrigued by it. Can’t wait to see her perspective. Would love to try some of these techniques! The quilts featured are amazing! That looks like it would be such fun to try! Thank you for the give away! Such a great book that I would love to have. These quilts are BEAUTIFUL! I wish I could make one of these. One day I’ll get there … Thank you for the amazing pictures! Love scrappy quilts. This bok looks very interesting. Thanks for the giveaway. Looks like a very colourful and inspiring book… would love to have this in my hands to stimulate my creativity and play with fabrics in a new and different way. Loving these modern quilts they looks so free and inspirational you do not always have to follow the rules. Looks fun! And way out of my comfort zone….so it would probably be good for me to try it out! It looks like great fun. Thanks for the opportunity to win. I have the scraps….all I need is the book! These quilts are amazing! I’m a new quilter, (made one baby quilt). thought she had a twin …. Nope, it’s a FULL! So I have a dilemma. Already cut the 6″ squares, and don’t have enough fabric. I also started with a panel, and framed it, so my measurements are all off. I guess I’ll be doing some “Improv”! Winning that book would be a great help. Such a lovely approach to quilting. Wow! This book really looks cool. This looks like a lot of fun. Like coloring but with my fabrics. Thanks for the chance to win. I love improv work, but I’ve only done it on small scale things so far (bags, mug rugs, mini quilts etc). Maybe this book will be the kick I need to do it on a big scale!! I have done some improve quilting — I still feel like I am thinking too much — too many years of traditional quiltmaking. I am happy with my results — just need to do more of it. Improv quilts are so intimidating to me! I always see one and think “Oh that is gorgeous, I should make one too!” but when it comes time I’m too scared and I have no idea where to start. These quilts are too cool! This book looks like it has quite a variety of styles–all of them fun! Always looking for new ideas and this looks perfect. Love trying curvy piecing. Love this and would love to win the book. I just made my first improv mini quilt…a gift for a dear friend’s 40th bday. Finsihed it last night. Cannot wait to give it to her! What a great approach to quilting. it’s a good way to stay fresh. Yes please! Inspiration for all. I would love to win this book & learn some new techniques. I love improv quilting. I don’t hang on to many scraps and instead use them immediately to quilt potholdera and my patterns are all improved based on what I have. What a wonderful book! Thanks for the chance to win a copy. Love your blog and would love a book on modern quilting techniques! So fun! Would love to try some improv! This book looks like a dream! I love it! Improv looks like fun! I’ve never tried it before, this book might be the push I need to give it a try. Improv is fun, but my efforts so far are only baby steps compared with the quilts in this book. Its been fun following the blog hop, seeing the quilts created by various bloggers. Thanks for the giveaway. I love improv piecing! This book looks like it’s packed full of inspiration! I was just looking at this book on Amazon last night and have it on my wish list. I am pretty new to the modern quilting scene…I didn”t appreciate them to begin with, but have warmed up considerably and have designed a future project using modern-type prints! Would love to see more of the book. Looks like a lot of fun project ideas. I love the Bias Strip Petals! Looks like a very interesting book. Something I haven’t ever tried. Would be fun t win the book. This looks like a delightful book to have. Learning new techniques and mixing them any way you want to get a unique quilt is a great idea. Thanks for the opportunity. I’ve read a lot about this book and would love to own it, thanks for the chance to win! I love the look of this book! I just added it to my wishlist on amazon. It is definitely my speed, I am a self taught maker of lovely wonky quilts! Love the meditative component off quilting prep & action that Ms. Wood describes. Would be thrilled to have her book. Truly inspirational! Thank you! Beautiful quilts! Would love to step out of my box and give modern quilting a try. This is way out of my comfort zone, but I think it is something I should try. It looks like a very good book to have and to get me to try this kind of quilting. I would love to learn improv quilting!! I have been following the blog hop and enjoying reading about the process of creating their sample quilts for the book and working with Sherri. What a beautiful and inspiring book! Thanks for the giveaway! Those bias petal quilt are gorgeous! Thanks for the chance to win! I haven’t tried any improv quilts yet but like the quilts I have seen. Would like to try one someday. What a wonderful book! Going to have to book mark those 10 reasons to improv though! Looks like a great way to explore modern quilts. I’ve only done a little improv, but I’d like to give it another go — thanks for hosting this giveaway. Such gorgeous pictures – thanks for the inspiration! Hi Amy! These petals, and all the scores I’ve seen from this book, look AMAZING. I’ve done improve but nothing like this and I can’t wait to see the book and try it. Thanks so much for a chance to win a copy! Looking forwar to learning more improv techniques. I love all the quilts. So many great ideas. Thanks for sharing with the giveaway. Improv quilting looks like fun! I’m adding this to my ‘to learn’ list. Very nice. Looks like a great book. Thanks for sharing the picture of “untitled” / 58″ x 54″ /AmyDame. I hadn’t seen that one before and really like how the curved petals are used! Love the examples from above. I would love to make some of these beautiful quilts Thanks for the chance to win the book. This is a style I want to try more of! I recently added the book to my wishlist. The quilts look so interesting. I would like to try a new technique. Would love to win the book. This book looks amazing! I’ve been eager to get my hands on a copy since well before publication. Fingers crossed that this is my chance! I would really love to win this book. My original passion with fiber arts started in college with appliqué and dyeing techniques and now I teach a fibers class (along with painting and drawing classes) at one of the large public high schools in town. I have recently rediscovered my love of quilts and am now teaching myself how to make them. My style is definitely more improv and I would be so inspired by this book. If you sent me this book I would share it with all my fibers students and hopefully instill the passion of quilting in them as well! I think i would enjoy this book! I love this style of quilting.